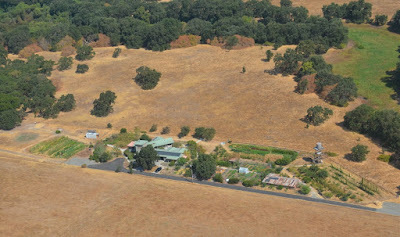 Kingbird Farms began as a large homestead-style garden feeding friends and the hungry (via the local food bank). Over the past 13 years we've successively layered on WWOOF hosting, sales to local cafes, and direct sales to local families via a web store, while greatly expanding our growing areas. Three years ago, we ramped up operations with the addition of a "Farm Manager" who received intensive mentoring, took all profits, and was responsible for everything from planting to sales to the care and feeding of "wwoofers." Each step had its pluses and minus, satisfactions and frustrations, but overall it's been an emotionally rewarding journey for the two of us. We've helped grow farmers (hosting over 150 wwoofers), helped build an appreciation locally for real food, and achieved a high degree of regional visibility through our collaborations with Slow Food and other organizations. And, perhaps most importantly, we've built good soil, created a model for farming with and in nature, and built the infrastructure (including solar irrigation system) for continued high-intensive growing at Kingbird. As rewarding as this has been, Charity and I - who both celebrate 65th birthdays this year - have decided that it's time for a new chapter in our lives. We have no intention - yet - of leaving our little paradise, but we have decided that we need more freedom and flexibility in our lives and less involvement in the day to day work of running a farm and managing people. Beginning in 2016, therefore, we'll either be handing the keys to the farming operation to a tenant (Scenario 1) or scaling down to a large kitchen garden (Scenario 2). That's how we've defined our current "fork in the road." 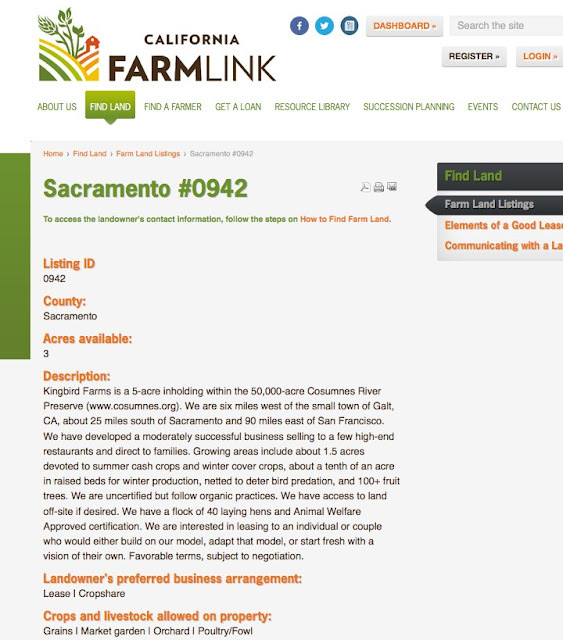 To implement "Scenario 1," we're working with California Farmlink, an organization dedicated to matching up farmers seeking land with landowners seeking farmers. Farmlink also has the technical skills and experience to facilitate solid lease agreements and we will be relying upon them for advice. The Farmlink posting is pictured below. To access it online and respond requires a $15 membership. We're happy to provide more information and engage in a dialog by email (email to kingbirdfarms at gmail), but applications will need to come through Farmlink. What kind of person(s) are we looking for? The following are important: some farm experience; ability to manage complex variables without frustration; a facility with social media; basic book-keeping and record-keeping skills; good people skills; the ability to work hard and at the same time draw and adhere to hard boundaries to protect personal time; and an appreciation for the aesthetics of farming and the beauty of a special place. 1) Providing advice and input and perspective on everything from soil to seasons to seed varieties to markets and marketing but otherwise staying out of the way except as desired. 2) Helping out with physical labor. 3) Providing "respite care" for the farm so that the farmer does not need to be on duty 24/7/365. In the meantime, please feel free to forward this link to anyone who might be interested or who might know of others who might be interested. And please be generous with feedback and advice. We value your perspective. The photo hints of apples to come, but it also depicts an oddity - a 3/4" baby apple on the same limb as emerging apple blossoms. What's going on there? We're actually seeing quite a bit of that this year, a function of the very warm winter that we had. Fruit trees need "chill hours" (in widely varying amounts) and when they don't get what they're best suited to the fruiting buds come out of dormancy erratically - some early and some late. On this Granny Smith apple tree budding began about 60 days ago and still continues. It looks like we'll get a decent crop. The only downside? Several rounds of thinning the baby fruit, instead of the usual once-through to reduce the load on the branches and assure better size.